Windows Live Messenger Strange Pop Up Message? Linked with Twitter and Facebook? [ad#ad-taalz-inpost-right]But one of the message that was hardly readable because of the overlapping text said that now we can link the Windows Live Messenger with Twitter. 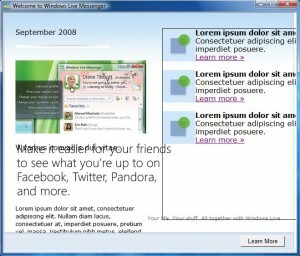 The status message of Windows Live Messenger will be linked with twitter some how. How? I don’t know that yet. May be from my Windows Live Profile page or somewhere, but I’m not sure yet. Will check it out later and write about it too.